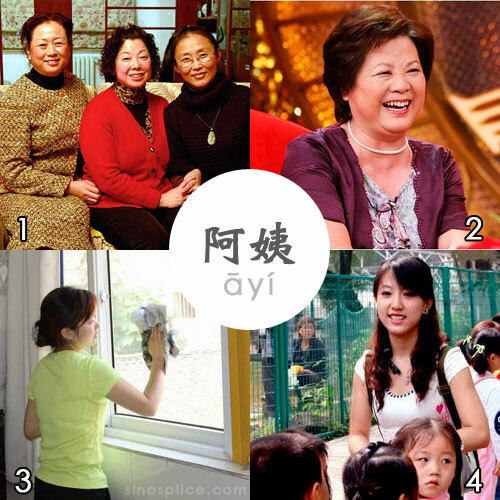 Today I’d like to bring up a fourth use of “ayi” which kind of circles back to the first one, but is also subtly different, and additionally extremely interesting in the way that it makes young women squirm in social discomfort. This is the use of “ayi” that you really only learn if you spend enough time around young (Chinese-speaking) children in China. 1. Little girls that are older than you are called “jiejie” (姐姐); little boys that are older than you are called “gege” (哥哥). Often this is a two-year-old calling a three-year-old “gege,” or even a 17-month-old calling an 18-month-old “jiejie.” That’s just how it works. 2. Little girls that are younger than you are called “meimei” (妹妹); little boys that are younger than you are called “didi” (弟弟). Again, the age difference might be tiny; it doesn’t matter. Even for twins, the older/younger aspect of the relationship is strictly acknowledged. So yeah, I’ve been observing my toddler calling strange young women “ayi” and watching these young women freak out. And yes, it’s pretty funny to me. If you’re in China and you’ve never noticed it before, be on the lookout for #4. It’s easy to spot, because it usually involves a young woman in her early twenties approaching and fawning over a cute little kid, then the inevitable offensive “ayi” term is used, the failed attempt at “jiejie” persuasion, and the young woman walking away pouting. Cheap DVDs are one of the well-known perks of living in China. For roughly $1 per disc, you can buy almost any movie or recent TV series. There’s a huge market for this form of entertainment, and it creates two significant forms of waste material. …and inside that was the actual DVD. The Chinese vendors are getting more elaborate with their packaging than the real (unpirated) DVD sellers. Why? Almost all of it goes straight into the garbage, and while some of the packaging may look good on the shelf, I can’t see the need for 6 layers of it. These pirated DVDs are essentially as disposable as a magazine. After one view, you might be ready to get rid of it, but if you want to keep it, you can. I remember when I first came to China I thought that every DVD I was buying was going into “my collection.” Well, you don’t have to be here long to realize that your collection will very quickly grow beyond manageable size if you keep everything you buy. And clearly not every DVD you buy is worth keeping, even if the picture quality is excellent. 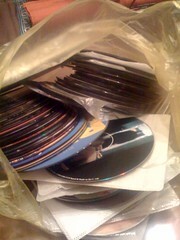 So now after I watch a DVD, if it’s not deemed worthy of keeping (and most aren’t), it goes directly into the “bag of crappy DVDs.” I usually just end up giving that bag to my ayi. Not sure what she does with them. How about you? What do you do with your unwanted DVDs? It’s a strange problem to have, but when I look at the amount of DVDs that are bought and sold on the streets of China, I’m reminded that it must add up to an awful lot of DVD waste. I have mentioned before that my ayi Xiao Wang is from Dongbei (东北, China’s northeast). I like her a lot, and perhaps one of the reasons is her impressive capacity for bluntness. A while ago I was setting up an electric fan for her so she wouldn’t be so hot when she’s cooking in the kitchen. At first I thought it was broken, because when I pressed any of the buttons from speed 1 to 3, nothing happened. It was definitely plugged in securely in a good socket. What I forgot about was that some of these fans have a “oscillation” dial that controls degree of oscillation, but it can also be set to “off.” This means that there are two places the fan can be set to off, and if either are set to off, the fan stays off. A little while after I incorrectly concluded the fan was broken, Xiao Wang realized the problem and got the fan working. I asked her what the problem had been. She responded, “You were so stupid! It was turned off on the direction dial.” Ah, thanks Xiao Wang. Always the charmer. I can attest to the fact that Mark’s Chinese is not bad at all. Likely the main problem was Xiao Wang is not used to a variety of accents (especially foreign ones). There was one other incident that made me feel really bad. Xiao Wang bought a bag of fresh peaches for us. She bought them on a Thursday and left them on the kitchen counter. She doesn’t come for most of the weekend, and I happened to be super busy that weekend, so I totally forgot about them. When she showed up the next Sunday she discovered most of them had spoiled. She made a big fuss about how I had needlessly let good peaches go to waste, and she had bought them as a gift for us with her own money (this I didn’t realize) for 10 RMB. She made it very clear that she was upset. I apologized profusely and ate some peaches right away from the parts that hadn’t spoiled. Xiao Wang is a good lady, but she’s blunt to the core. Gotta love her. Assuming that you’ve given it some thought and decided to hire an ayi (housekeeper), you might still be unsure how this whole thing works. I’ll try to answer a few questions based on my own experiences. How do you find an ayi? The first way is the referral system. People that have found a good ayi usually love to recommend her. Most ayis need multiple jobs to make a decent living, so they welcome the introductions. People also enjoy the satisfaction of “discovering” a great ayi and connecting her with new clients. You could ask foreign friends, Chinese friends, co-workers… even the administrative office of your apartment complex might be able to help you out with this (although it won’t necessarily be free). The second way is through agencies. They might not be immediately obvious to you. They won’t have big “Ayis Are Us” neon signs. Most of these agencies are very small businesses tucked away in a tiny office. Your apartment complex might offer this kind of service, so it’s a good place to start looking. The independent offices will usually have a sign out containing the word 家政, which means “house management” (housekeeping). Most often the sign will read 家政服务 (housekeeping services). Their services cover typical housecleaning and cooking. Basically, you just walk in and tell the administrator in the office that you need an ayi. You will need to explain what tasks (typically cleaning and/or cooking) you need an ayi to do for you, at what time(s), and how often. You may be asked how much you’re willing to pay, so you should find out the going rate for your city in advance. (As I mentioned perviously, in Shanghai the going rate is 6-8 RMB/hour.) You will need to give your name and a phone number for them to contact you. You will have to pay a service fee. I have gone through this procedure twice in Shanghai. The first time the service fee was 50 RMB (in Jing’an District). The second time it was 30 RMB (in Changning District). Hold on to your service fee receipt, because you need it to exercise your right to get another ayi if the first one doesn’t work out for whatever reason. After the initial matchmaking, the relationship is out of the agency’s hands and between you and your ayi. There’s no need to ever go back to the agency if there are no problems. How do I pay my ayi? Officially, ayis are seen as a kind of 钟点工 — a wage worker. That’s where the 6-8 RMB/hour comes in. In practice, though, it’s usually much more convenient to pay your ayi a fixed amount monthly. This monthly payment method is called 包月. Both systems can have problems. The hourly system encourages slow work. I think this is pretty obvious. Why should the ayi wear herself out doing work quickly when that just means she gets paid less? Most ayis will not overdo this trick, but don’t expect snappy cleaning when you’re paying by the hour. The monthly system encourages fast work. I paid my first ayi in Shanghai on a monthly basis. At first everything went well. She was a pretty good cook. But there were no absolute hours specified from the get-go. It was more of a “come and cook, and then do a bit of cleaning” arrangement. As time passed however, she started leaving earlier and earlier. The “cook and clean” routine went from two hours each time to barely over an hour. Her cleaning efficiency suffered quite a bit. I think the best balance is to pay monthly, but insist on fixed hours. It was my mistake for not doing this. I’m sure my ayi was trying to finish quickly so she could rush off to another job. I don’t really blame her, but I think I made a rookie mistake. If your ayi knows she has to stay for a certain amount of time, there’s no temptation to do a sloppy job in order to leave earlier. I think it’s also a good idea to make the monthly payment a bit more than just the hourly rate multiplied by the total number of working hours per month in order to keep your ayi happy. The other option I haven’t mentioned is the live-in ayi. I have never tried this, so I don’t have any experience with it. How does the cooking thing work? Where your ayi buys groceries brings up another trust issue. If she buys groceries at the local vegetable market (菜场), she’s not going to have any receipts. You’re going to have to take her word for what she pays at the vegetable market. If you don’t want to do that, then you have to insist that she buy everything at the supermarket (超市), which provides a receipt. Assuming your ayi is honest, this will cost a little bit more. Your ayi will be buying fresh ingredients every day, so I think it’s only fair to compensate her for the time she spends buying your food. I add about half an hour for shopping per day into the calculations. As for what she cooks, expect only Chinese food. I know there are lots of ayis out there that know how to cook spaghetti and other Western dishes, but they’re typically well out of that 6-8 RMB range. I have always just made a list of the foods I don’t eat, and let my ayi determine the menu. I usually don’t have to tell her very often that I don’t like a dish (or to stop making a certain dish so often), and any time I think of something I’d like to eat, I can just ask her to add it to the menu. I imagine your ayi may be receptive to learning how to cook new dishes, but I’ve never tried that. I probably make all this seem more complicated than it is. If you’re considering hiring an ayi, I recommend just trying it out and see what develops. The worst that’s likely to happen is a few bad meals. I really need to to stop eating dumplings for lunch every day. Why are frozen dumplings so good? I boil them and put some hot and sour sauce on them. (The sauce is called 酸辣酱, by a company called “爱之味.”) Yum. In China, eating rice is manly. It goes with smoking and drinking. Every time I turn down a cigarette with a “I don’t smoke,” people are disappointed. When I drink with them, they are very happy, nodding in approval. When I don’t eat much rice (like only one bowl), they demand I have another bowl. They don’t want to hear any of that “we don’t eat this much rice in the West, especially not at the very end of a meal” crap. So I was happy once I got into my “rice zone.” I was capable of eating two to three (smallish) bowls of rice with every meal. Normal whiteys fresh off the boat cannot do this. It took me years to get to that point. Lately, I’ve lost it. I’m not sure what it is. A few months ago, when Ayi gave me a heaping bowl of rice (and that’s a big bowl, not the restaurant size), I would eat it all in the course of my meal. Now, I take one look at that bowl and I’m sure I can’t finish it. When I put back half the bowl, she scowls in disapproval, the “a big tall guy like you should be eating more rice than that” written very clearly on her face. Maybe I’m just ready for a visit home. 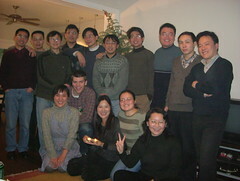 Back in the days before I had an ayi to cook for me, I taught spoken English classes at ZUCC in Hangzhou. I had a pretty nice apartment there with a full kitchen. I could have easily hired a cook there too, but never did. 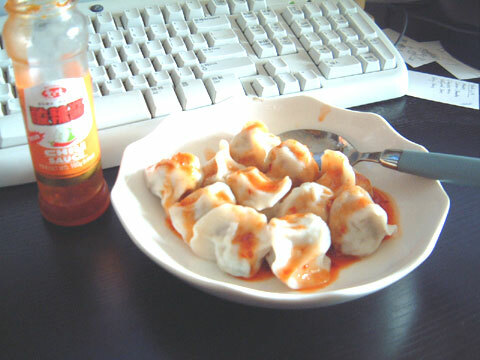 I rarely cooked myself, besides boiling frozen dumplings in instant soup and then dousing them with sweet and spicy sauce. Most of my meals were spent with my awesome co-workers at ZUCC. Still, in my last semester at ZUCC I hatched a plan. It was cunning. It was brilliant. It was never put into effect. But maybe there’s still hope for some enterprising teachers in China if I share it in my blog. OK, let me lay it out for you. When I was there, the teachers at ZUCC liked home-cooked meals, but they were lazy. For some reason they were also unwilling to hire a cook. The students ate in the cafeteria day after day. They longed for home-cooked food, but had no cooking facilities. Some of them were even great cooks, but had no way to share their gift. Do you see where I’m going with this? You may think you do, but it gets better. Announce to each class that you’re holding a cooking competition in your own home. Students who wish to enter should enter in teams of 2 or 3. Have them sign up and include what evenings they’re free. Share with them your judging criteria and tell them what cooking facilities/supplies you have. Tell them they will be cooking enough food for 4-5 people. Create a schedule for the teams. There are several ways you can do it. If you have a lot of classes, you might want to assign a whole week (Monday through Friday) to each class. Each night of that week one team would come to your place and then cook and eat with you. Alternatively, you could assign a day of the week to each class, and a different team could come every week. Tell the students they have a 20rmb budget for the dinner (which is plenty). They know what they’re going to make, so they need to buy the ingredients and then show up at your place to prepare it. Unless you’re a jerk, you should reimburse the students the 20rmb. You might have to fight to make them take it, but you really should. If they spent less than 20rmb, they’ll give you the change. I really doubt any students would try to “make money” by making a super cheap meal. Stay out of the way while your students prepare the meal. Two or three people is plenty to get the job done. When the meal is done, take pictures of it with your digital camera. After the meal chat with the students for a while and then secretly write down your judgments. Your students will probably try to wash your dishes for you (but not in every case). Handle that how you see fit. Put the pictures online with a description. You might want to include the judges’ scores. That’s your call. I think originally I had it all worked out to the point where I could even make money on the scheme, and everyone was happy. Perhaps it’s better that it never went into effect, though. It had all the makings of a scandal. A while back I told you about my ayi (阿姨). Now I’m going to tell you some more. My ayi comes from Hubei province. She has a son there attending Wuhan University. I don’t know more about her particular family circumstances than this, but knowing just this much it sounds like a difficult situation. My ayi is probably in her early 40’s. My ayi always calls me xiansheng (先生), something like “sir.” I’ve asked her many times to just call me by my Chinese name, but she forgets five minutes later, once again calling me xiansheng. My ayi never joins me for dinner. In the beginning I would try hard to get her to enjoy with me the meal she prepared, but she steadfastly refused every time. 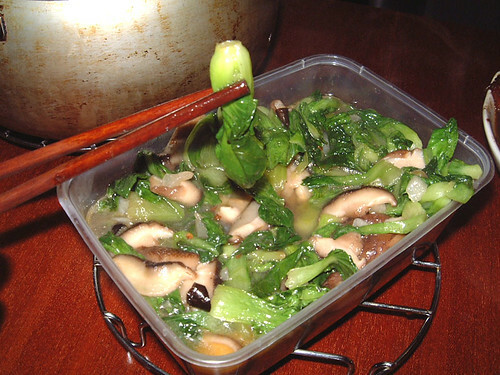 Chinese people typically eat dinner between 5 and 6pm. I imagine she’s eating at close to 8pm on a daily basis. My ayi comes 6 days a week. At about 5:30pm she goes to the market to buy fresh ingredients. She then bikes to my apartment, arriving at 6pm. Dinner is ready around 6:30. She leaves around 7pm. She used to stay longer, but she still seems to be getting the job done. I don’t begrudge her a little haste. My ayi acts as housekeeper/cook for a number of households. She has worked for foreigners before, so she has a bit of knowledge about “what foreigners like” (or don’t like). You might argue that it’s impossible to make such generalities, but I think it’s pretty safe to say that most of us foreigners don’t like chicken feet and things like that. Her experience rings pretty true for me, anyway. My ayi knows which foods and ingredients I don’t like, and she’s never once slipped up and made something I don’t like after I had already told her. My ayi always carries a notebook in which she makes careful note of all her employers’ expenses. She periodically gives me these figures so that I know exactly how much I’m spending on the actual food. It comes out to about 100 rmb (US$12.50) per month. My ayi carries her cell phone around and usually gets at least one call while she’s here. Her cell phone is nicer than mine. My ayi understood fine when I requested that she not use the kitchen dish towel to clean dirty things. I explained that the dish towel is for wiping water off clean things, and I didn’t want it to get dirty. (When she first came, I lost one dish towel that way.) I guess she decided she didn’t have enough rags to clean with, though, because one day I found that she had ripped my dish towel in half, leaving only one half hanging clean and faithful at its post while the other half was dispatched to explore less pristine regions. My ayi hates wasting food. I feel the same way, so it’s no problem. Still, every now and then she suspects that I don’t like something, or a dish has been reheated several times, and is afraid I’ll throw it out. She’s not too timid to ask me not to waste it, or to scold me mildly if she catches me throwing something out (which is rare). One time she made something that I didn’t like. She could tell, and rather than let me waste it, she took it home for herself to eat. I didn’t mind at all. She never made that dish again.